Love Racecations? Got Wanderlust? Check Out These 5 Racecations You Won't Want to Miss! 5 Racecations You Don’t Want to Miss! I’ve had some severe concentration issues this week, guys. I’m juggling work, blogging, end-of-school year shenanigans, and the usual household chores. But for some reason it’s been super hard for me to focus. Having said that, TGI-freakin’-F! OH! Snap. I just realized maybe why… uh, hellllloooooo? Taper, anyone? Yeah, that’s right. I may or may not have a huge trip and/or race coming up in a week. Yowza, that snuck right up on me, didn’t it? It’s fitting that today’s topic is “vacations” because I recently realized the times I travel I’m usually racing at my destination — aka racecations. I honestly don’t travel all that often but if you’re gonna travel, might as well make it a racecation, no? I never really considered myself big into racecations but looking back over my race history, it turns out I do like to find new places to run. In honor of my crazy week of taper, ridiculous workouts, and questioning my sanity at times, and since it’s the Friday Five 2.0, I’m reflecting today on the four racecations I’ve taken already — and the one coming up! Got Wanderlust? Check Out These 5 Racecations You Won’t Want to Miss! The Papa John’s 10-Miler was my first race of any distance past a 5K. It was 2014, I was newly back to running after having my daughter, and I was a nervous wreck. There were so many things up in the air: 1. I was meeting people in person I had never met before. 2. I was traveling fairly far from home and completely out of my own element. 3. I would be reuniting with my dear friend. 4. It was 10 miles. The farthest I had ever run in my life was 9. On the plus side, it was super fun! Check out the whole recap here. I would definitely run this race again. In the fall of 2014 I found myself back in Kentucky for yet another race. This time it was the Iron Horse Half Marathon. I originally heard about this race from a flyer from the Cleveland Marathon. It wasn’t too expensive and when I saw it was in the heart of horse country, I knew I had to go. I traveled to Midway, KY with my gal pal, Julie, and we had a blast. The town of Midway was super cute, and the Iron Horse Half Marathon did not disappoint. It was my first experience with humorous race day signs, too. I’ll never forget it because it still makes me laugh to this day. 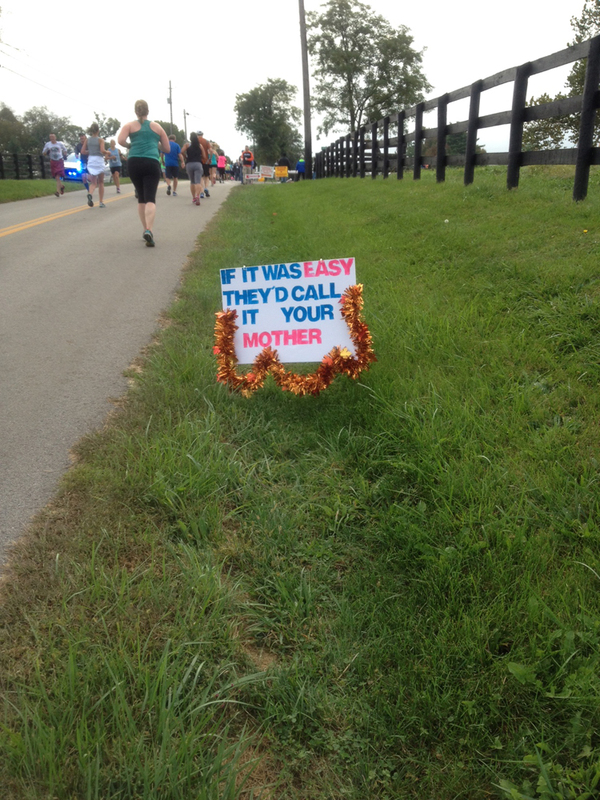 If you’re ever near Midway, KY in October, I highly recommend running the Iron Horse Half. It was incredible. I stayed local in 2015, but fast forward to 2016 and I’m back to traveling for races. 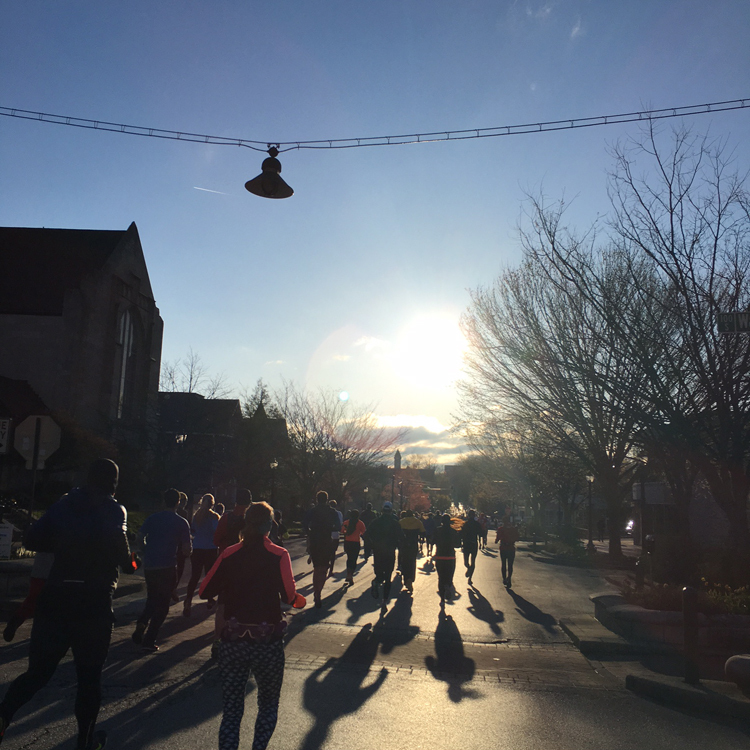 This time I had the opportunity to run the Hoosier Half at my alma mater, Indiana University in picturesque Bloomington, Indiana. I was super excited to run this race because it was an excuse for my husband and I to drop the kids off at the grandparent’s house and head south for the weekend. OORAH! This race I will never forget. I dealt with a major heat wave, an ITBS flare-up, and suffered through 26.2 miles, but still had the time of my life. So much so that I’m heading back again for more! 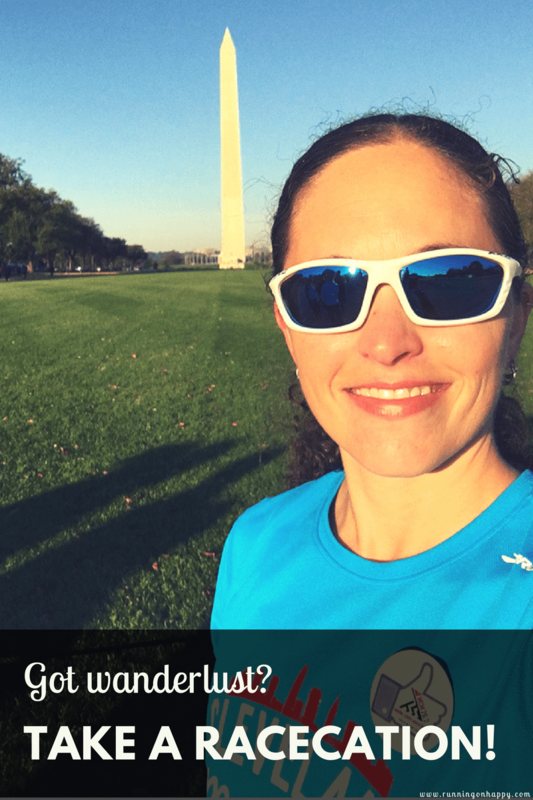 The Marine Corps Marathon is unlike any race I’ve ever run. The city, the crowd support, the support of other runners, the Blue Mile — all of it. The whole package. If there’s one marathon on your bucket list, make it MCM. And now for the one I haven’t yet done… next week I’ll be heading up north to hike, canoe, frolic, and meander through the woods. The north woods was my home away from home for five years in my formative years, and I have some incredible memories from my time spent in the area. Oh, I’ll also be running a race while I’m there. That’s right, in just a few short days (?!?!?!) I’ll be running Grandma’s Marathon. This will be my third marathon and I’m hoping third time’s the charm. (And if it’s not, hopefully the 4th is since I have MCM coming up in October. I digress.) I’m really hoping the stars align for beautiful weather and a lovely race day. And even if they don’t, I’ll at least have the wonderful opportunity of meeting some of my favorite bloggers in the flesh. I can’t wait! And those are my five racecations (so far). I’m always looking for an excuse to travel and it seems like the best way to do so is to… oops! I accidentally signed up for another race… You feel me? I bid you all a fantastic weekend. Have a blast getting those long runs in and enjoying the summer sunshine! I think we finally have some heat heading our way so I’ll be sure to get out early and enjoy the pool in the afternoons. What’s your favorite place to visit, run, or race? I’m still sad that I won’t be joining you for Grandma’s. After all, I’m the one who talked you into it. Damn RA. We’ll just have to pick another race to connect at. I want to do one of those city running tours, where you see the sites except you’re running instead of walking/biking/etc. It’s another way to see a new place without the anxiety or neevousness of a race! Those totally look so fun!! MCM is my hometown race, but I love it. I have a huge list of races I want to run “someday”, but my goal right now is hitting all 50 states in an expedient manner LOL. I have a mini relay and a paella party this weekend. Should be a good weekend. What’s a paella party? Sounds delicious. In theory I’d like to run all 50 states. I just don’t see it happening anytime soon for me. Me too! Should be a blast!! My training hasn’t gone all that well over the last couple weeks but eh… it is what it is, right? SEE YOU SO SOON!! I have my Grandma’s shirt on right now! You’re going to LOVE it. What a great race and Duluth is super cute, too. I have never done a race in DC but it’s on my bucket list. You didn’t include NYC! My fave racecation spot or Chicago, my current home base. Both are terrific for running and visiting!! I’m all about the racecations. This year I’m traveling to Chicago, Montreal and Philly for races and I’m very excited for all 3, even though I’ve been to Chicago and Philly before. I wish I was going to Utah this weekend, or joining you for Grandmas! Montreal sounds amazing. I would love to go there. Obviously I agree. Best ever! I’ve got to get back to that Hoosier Half at some time before my daughter graduates! Have fun at Grandma’s! I’d love to do the Marine Corps Marathon one day. I’ve never spent time in DC and it’s really something I want to do. I’ve been fortunate to run marathons in Hawaii, Paris, St. George, and San Francisco. And I guess the many I’ve done in San Diego can be considered racecations because packing, travel and hotels are involved. Running takes you to amazing places! I love D.C. It’s my fave city! You’ve run in some really cool places. Hawaii and Paris sound amazing. I have read so many great things about the Grandma’s marathon. Can’t wait to hear what your thoughts are on it. Enjoy the rest of your taper before the big race! Thank you! I’m looking forward to it. I haven’t been up to Duluth in forever so I’m really excited to go back. Obviously I love me a racecation. Maybe a little too much. I runfess that one run this week was all the running that happened. A little too much hiking. We’ll see how that plays out tomorrow. Don’t worry — I’m not! Hiking = running during race week. You’re gonna do great! Woohoo!! If only I had more time and money. I would love to take more race-cations. Right now, most of mine are within driving distance or staying with friends in Fla. Though, I am going to Vegas in Nov – so excited about that. Are you doing RNR Vegas?! I so wanted to do that one but I’ve got too much on my plate this year. When I travel for races it’s on the cheap. I totally relate to needing more time and money! I love traveling to places where I can see friends I haven’t seen in a while. I flew up to Oregon for the Eugene half in 2013, which I ran with my high school best friend. I also get to see a friend in Vegas, whom I haven’t seen since we graduated from college. You’re going to have a blast running Chicago!! Those events are in parts of your country I have never visited… but I do like to run when I vacation! Yeah, they’re all kind of in the middle of nowhere. Except for MCM being in D.C. and all. I am thinking I need to take more race cations! What could be better than traveling to a race with a bunch of friends to a new location! Happy taper! Well, I obviously agree. 🙂 Racecations are great excuses for an adventure. Just run early before it gets hot! 🙂 You’ll do great! I’ve really only traveled out of state specifically to run a race a few times but always make a point to run a few miles every time I travel! Marine Corps would be so cool but since I’ll most likely never do a full…. I’d love to do the Army 10 miler some time. This year seems to be all about racecations for me…I’ll be going to Seattle for the first time next weekend for the RNR half. I’m nervous but excited – I still have no idea what I want to do! I also recommend the Buffalo Marathon/Half Marathon over Memorial Da weekend. I’d love to do a run in Key West or somewhere similarly nice in the winter months! I’m a MN girl at heart and want to run Grandma’s so badly! I almost did in 2012, but ended up moving out of state just a couple weeks before the race. I hope you have lovely weather for it. I can’t wait to hear how it goes! Racecations are the best!! I just had one last weekend and am headed to another, San Francisco, next month. This is my first year doing racecations but I started with a bang with the NYCHalf, and Denver was fun too! I can see how it’s addicting. 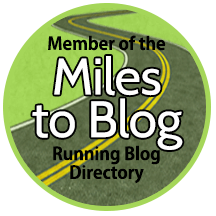 Great roundup of races, it’s nice to hear your thoughts on them. My favourite run was along something called Hadrian;’s Wall, In Northumberland in England. I loved it! This is a great roundup of races! Racecations are my favorite thing! Earlier this year I went to California for the first time and completed my first half marathon. It was such a great race and vacation.